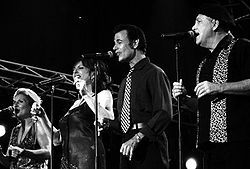 The Manhattan Transfer is a jazz vocal group founded in 1969 that has explored a capella, vocalese, swing, standards, Brazilian jazz, rhythm and blues, and pop music. There have been two editions of the Manhattan Transfer, with Tim Hauser the only person to be part of both. The first group consisted of Hauser, Erin Dickins, Marty Nelson, Pat Rosalia, and Gene Pistilli. The second version of the group, formed in 1972, consisted of Hauser, Alan Paul, Janis Siegel, and Laurel Massé. In 1979, after Massé was badly injured in a car accident, she was replaced by Cheryl Bentyne. The group's long-time pianist, Yaron Gershovsky, accompanied the group on tour and served as music director. Trist Curless from the Los Angeles a cappella group m-pact became a permanent member in October 2014 following Hauser's death. In 1969, Tim Hauser formed a vocal group in New York City called the Manhattan Transfer after the novel by John Dos Passos. The group consisted of Erin Dickins, Marty Nelson, and Pat Rosalia, and Gene Pistilli. This group made one album, Jukin' (Capitol, 1971), which looked at the music of the past critically and satirically, rather than respectfully as in all later incarnations of the group. The album was unsuccessful commercially and critically, and the group broke up. Three years later, Hauser met Laurel Massé while he was a cab driver and she was his passenger. Soon after, he met Janis Siegel and Alan Paul and started another version of the Manhattan Transfer. After performing in clubs in New York City, the quartet released its debut album with guest appearances by bona fide jazz musicians Randy Brecker, Jon Faddis, and Zoot Sims. The Manhattan Transfer (Atlantic, 1975) lacked the condescension of the previous album, presenting instead serious vocalese renditions of "Java Jive" and "Tuxedo Junction" and scoring a Top 20 hit with "Operator". During the summer of 1975, the group hosted a musical variety show on TV. Their next album, Coming Out, produced "Chanson d'Amour," which was a number one hit in England. In 1978, Laurel Massé was in a car accident and dropped out of the group. She was replaced by Cheryl Bentyne. The group's next album, Extensions (Atlantic, 1979), produced the hit "Twilight Zone", a tribute to the TV series. Extensions featured a cover version of "Birdland", an instrumental by the jazz fusion group Weather Report, with lyrics by Jon Hendricks of Lambert, Hendricks, and Ross. One of the most popular jazz recordings of 1980, "Birdland" won the Grammy Award for Best Jazz Fusion Performance, while Janis Siegel won the Grammy Award for Best Vocal Arrangement. In 1981, the Manhattan Transfer made music history by becoming the first group to win Grammy awards for both popular and jazz categories in the same year. "The Boy from New York City", a cover of the 1965 success by The Ad Libs, reached the Top 10 on the Billboard 200 and won them the award for Best Pop Performance by a Duo or Group with Vocal, and "Until I Met You (Corner Pocket)" earned them a Grammy Award for Best Jazz Vocal Performance, Duo or Group. Both of these songs appeared on the group's fifth album, Mecca for Moderns (Atlantic, 1981). In 1982, the group won another Grammy, for Best Jazz Vocal Performance, Duo or Group, for its rendition of "Route 66". The song was featured on the soundtrack to the Burt Reynolds film Sharky's Machine. In September 1983, the group released the album Bodies and Souls, with an urban-contemporary style which resulted in two R&B chart singles. The first was the No. 2 hit "Spice of Life", which was co-written by former Heatwave member Rod Temperton who had penned several hits for Michael Jackson. The single also reached No. 40 on the US pop chart and No. 19 in the UK. The other single, the ballad "Mystery" (#80 R&B, No. 102 Pop), was later covered by Anita Baker on her 1986 album Rapture. In 1985, the group released two albums; the first was Bop Doo-Wopp, which included both live and studio recordings, and the second was Vocalese, which received twelve Grammy nominations—at the time making it second only to Michael Jackson's Thriller as the most nominated single album ever. The group won in two categories: Best Jazz Vocal Performance, Duo or Group, and Best Arrangement for Voices. This was followed by a live recording of many of these songs titled Live. This concert, recorded in Japan, was also released on VHS and DVD, later titled Vocalese Live. For their next album, Brasil (1987), the group headed south to work with Brazilian songwriters and musicians Ivan Lins, Milton Nascimento, Djavan and Gilberto Gil. Brasil won a Grammy for Best Pop Performance by a Duo or Group with Vocal. The group did not release any studio albums again until 1991, when they signed with the Sony Music label and released The Offbeat of Avenues, featuring original material written or co-written by members of the quartet. Their efforts brought them their 10th Grammy award, for the song "Sassy". This was followed by the release of their first holiday album entitled The Christmas Album in 1992. Switching back to Atlantic Records as their distributor, they released Tonin' (a collection of R&B and popular successes from the 1960s), The Manhattan Transfer Meets Tubby the Tuba (a children's album), and their 1997 album Swing which covered 1930s-era swing music. Their final album for Atlantic was The Spirit of St. Louis in 2000, dedicated to the music of Louis Armstrong. The group was inducted into the Vocal Group Hall of Fame in 1998. The group signed to the Telarc label in 2003 to release Couldn't Be Hotter, a live performance capturing many of the songs from The Spirit of St. Louis. In 2004, the group released Vibrate, another one of their "pastiche" albums, blending original tunes with older ones, pop, jazz and funk. Vibrate featured notable musicians such as bassist Will Lee and Steve Hass on drums. They also released, first in Japan, their second holiday album, An Acapella Christmas, in 2005. The album was released in the U.S. in 2006. During 2006, the group released The Symphony Sessions, a collection of some of their best known songs re-recorded with an orchestra, and also The Definitive Pop Collection, a two-disc collection of the group's material from their time with Atlantic Records. They also recorded their first original title song for a movie, "Trail of the Screaming Forehead"; and, in late 2006, the group released a new concert DVD, The Christmas Concert, and was broadcast by PBS. The Chick Corea Songbook, a tribute to the works of American jazz musician Chick Corea, was released in September 2009. The album features an appearance by Corea himself on the track "Free Samba". Other prominent musicians on this recording are Airto Moreira, Scott Kinsey, Steve Hass, Alex Acuña, Jimmy Earl, John Benitez, and Christian McBride. In 2011, The Manhattan Transfer worked on an album of previously recorded, but never finished, songs to honor their 40th anniversary. "We are working on a project now that is called The Vaults. Over the years, there are a lot of different songs that we recorded but never finished. We pull out from the archives a lot of these songs and are finishing them," said Alan Paul in an interview for Jazz FM radio in Bulgaria. One of the highlights of the album was a vocalese version of George and Ira Gershwin's The Man I Love, based on an Artie Shaw and his orchestra performance of the composition, which had been slated for the Swing album. In 2011, while undergoing treatment for Hodgkin's lymphoma, Cheryl Bentyne was replaced on stage for eight months by the soprano Margaret Dorn; Dorn replaced her again December 2013 (followed by Katie Campbell in early 2014) while Bentyne underwent further treatment. Tim Hauser was absent from the stage in 2013 and early 2014 as he recovered from spinal surgery; he was replaced on stage by bass/baritone Trist Curless of the a cappella group, m-pact. In September 2013, one of the original members of the group, Erin Dickins, started a Kickstarter campaign to re-record "Java Jive" with the surviving original members. The project was successfully funded on October 9, 2013. Original member Pat Rosalia died from cancer in July 2011. Tim Hauser died of cardiac arrest on October 16, 2014. Following Hauser's death, the group announced Curless would replace him. A League of Their Own OST (1992): "Choo Choo Ch'Boogie" and "On the Sunny Side of the Street"
Home Improvement (1992): Sing "Santa Claus Is Coming To Town" and "It Came Upon The Midnight Clear" as part of a Tool Time Christmas special ("I'm Scheming Of A White Christmas", Season 2). ^ Manhattan Transfer, November 1, 2013. "Ladies and Gentlemen ... Trist Curless!". Manhattan Transfer Official Site. Retrieved 2 December 2013. ^ a b c d Weber, Bruce (17 October 2014). "Tim Hauser, the Founder of the Manhattan Transfer, Dies at 72". The New York Times. Retrieved 13 March 2017. ^ a b c d e Bush, John. "The Manhattan Transfer". AllMusic. Retrieved 11 March 2017. ^ The introduction of the song is incorrectly attributed in the liner notes to Bernard Herrmann, who wrote the theme for Season 1 of The Twilight Zone only. The more famous Twilight Zone theme that is used in the Manhattan Transfer song was composed by Marius Constant. ^  Archived April 2, 2012, at the Wayback Machine. ^ Manhattan Transfer, November 28, 2013. "Ladies and Gentlemen ... Margaret Dorn!". Manhattan Transfer Official Site. Retrieved 2 December 2013. ^ Dickins Geyelin, Erin. ""Java Jive" Jazz for Foodies". Kickstarter. Retrieved 1 December 2013. ^ a b Roberts, David (2006). British Hit Singles & Albums (19th ed.). London: Guinness World Records Limited. p. 346. ISBN 1-904994-10-5.